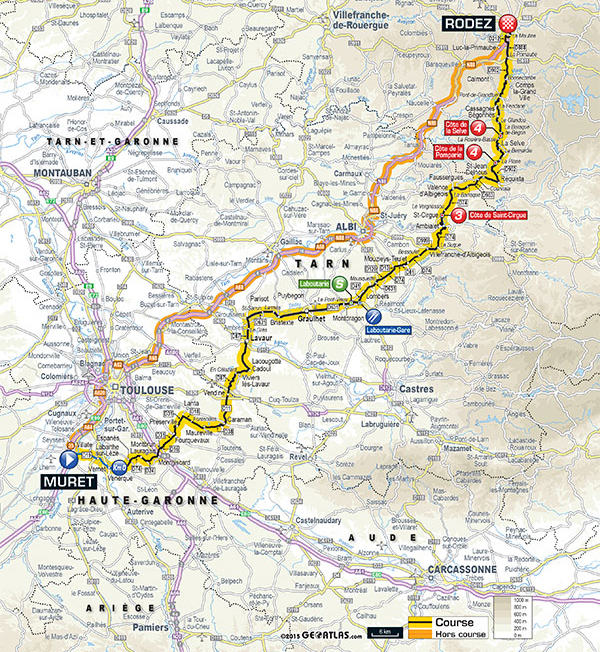 The Race: Today’s 198.5 kilometer stage started at 12:46 PM. All 175 riders who finished Thursday’s difficult stage (there were two abandons yesterday) were on the line today. The day was far from flat with three rated climbs. The pure sprinters would have a tough time of it because in addition to the three climbs, the stage had a 570 meter 9.6% uphill finish. 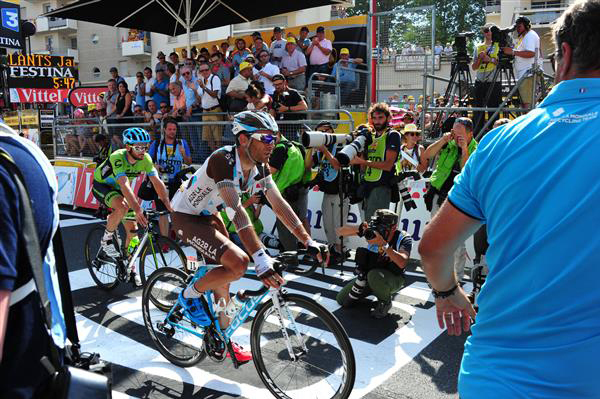 The day favored riders like Peter Sagan or perhaps, adventurous racers who like to attack well before the stage end. At the beginning of the Tour de France in Utrecht, the Netherlands, sprinters debated over stage 13, from Muret to Rodez, on whether they should consider it a day for them or not. Mark Cavendish made it clear that it wouldn't be the case and he'd had to wait for either stage 15 to Valence or stage 21 to Paris to get a second opportunity to win after Fougères. There are two reasons for that. Firstly, the last third of the course is undulated. Hard racing would put the pure sprinters into trouble. 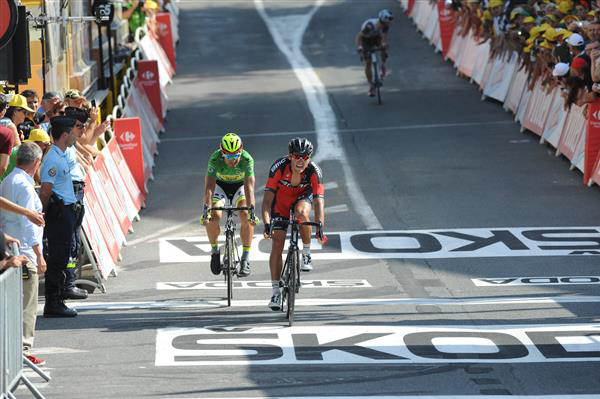 In this case scenario, it would favor Peter Sagan over Cavendish and André Greipel. Secondly, it's a typical day for attackers. 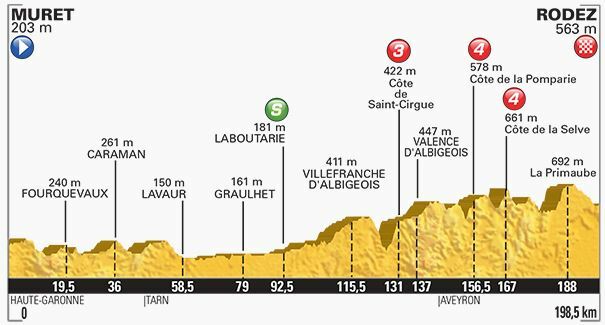 Sprinters' teams will be tired after three days in the mountains and some riders have very few chances to win this kind of so-called transition stage. Cannondale-Garmin is that category of team that came with no sprinter and aren't really concerned with the general classification anymore, so this is an opportunity for someone like Ramunas Navardauskas to repeat the great stage victory he picked at Bergerac last year. 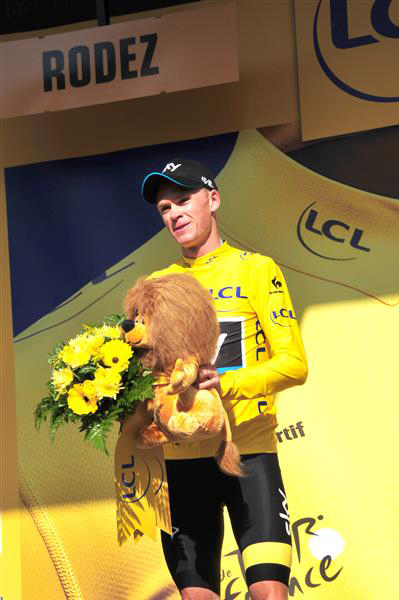 So far race leader Chris Froome has been a rock, handling everything that has been thrown at him. With the Pyrenees in the rear view mirror, he’s roughly three minutes ahead of Tejay van Garderen and Nairo Quintana. At the gun, the day’s first break was quickly scooting up the road: Alexandre Geniez (FDJ), Thomas De Gendt (Lotto-Soudal), Cyril Gautier (Europcar), Nathan Haas (Cannondale-Garmin), Pierre-Luc Périchon (Bretagne-Séché Environnement) and Wilco Kelderman (LottoNL-Jumbo). With 85 kilometers under their belt, the escapees were 3min 44sec ahead of the pack. At the intermediate sprint, André Greipel was seventh, Mark Cavendish ninth and Peter Sagan tenth. That put Greipel back in the virtual green sprinter’s jersey, a single point ahead of Sagan. After the first rated climb, the third category Côte de Saint-Cirgue, Tinkoff-Saxo took over the job of dragging the peloton, now about 3min 20sec behind the six breakaway riders. Last year’s second-place finisher, Jean-Christophe Péraud crashed and left a lot of skin on the ground. After being attended to by the Tour doctor, he gamely got back on his bike and chased (with no small help from a long, sticky-bottle hand-up from the team car) and eventually regained the field. And after passing over the two fourth-category climbs, it was clear the six escapees were on a short leash. 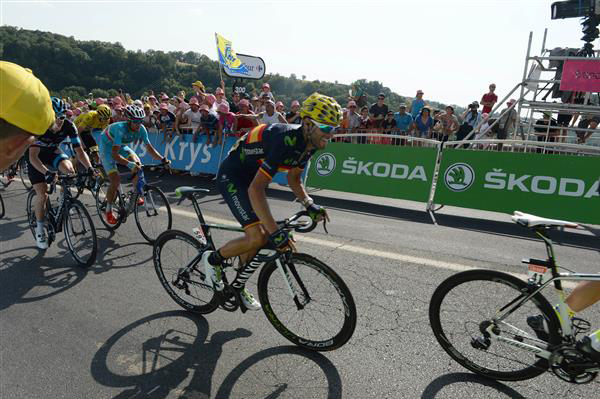 With MTN-Qhubeka and Orica-GreenEdge starting to help out at the front, the gap was just two minutes. Greipel was shelled on the climbs, making Sagan’s job of getting back the points classification leadership a lot easier. With twelve kilometers to go, three of the break riders were clear: De Gendt, Kelderman and Gautier, with the pack just one minute behind. In fact, the peloton could see the break, usually bad news at this point in a race. The news for the break didn’t get better. As they passed the six kilometers to go mark, they had just thirty seconds. 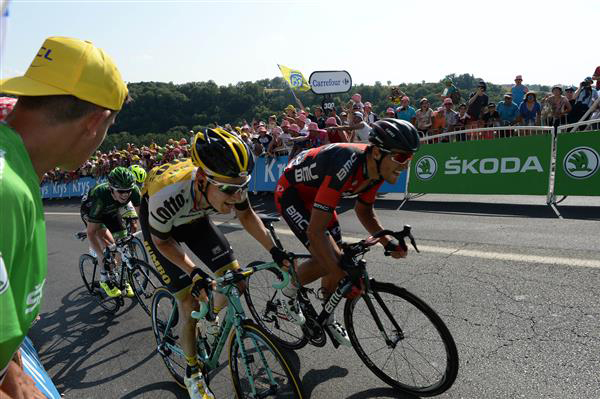 Froome was right up near the front of the peloton, riding just where he should. Three kilometers to go, the gap was twenty seconds. Starting the final uphill ride to the finish, just two kilometers from the line, the trio had just thirteen seconds. They couldn’t do it. 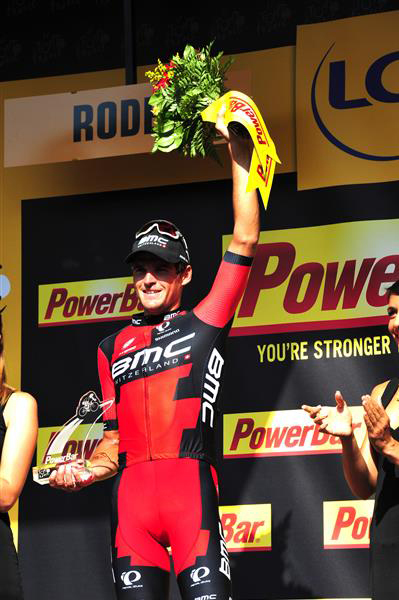 They were caught and Greg van Avermaet won the stage, beating second-place Peter Sagan. Christopher Froome finished safely to remain the overall leader, 2min 52sec ahead of Tejay van Garderen. All 175 starters finished. 5 MARTENS Paul LOTTO NL-JUMBO s.t. 7 NIBALI Vincenzo ASTANA s.t. 8 CONTADOR Alberto TINKOFF-SAXO s.t. 9 VALVERDE Alejandro MOVISTAR s.t. 11 GALLOPIN Tony LOTTO-SOUDAL s.t. 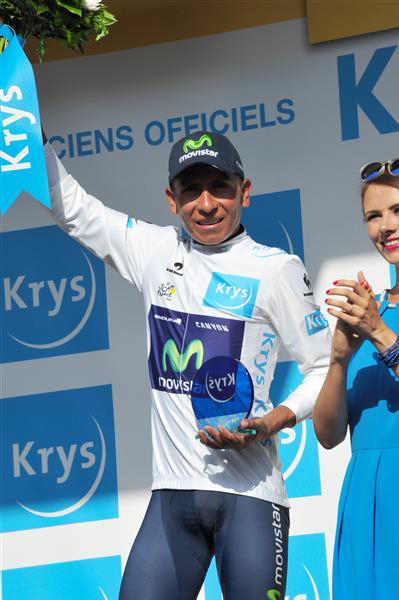 12 QUINTANA Nairo Alexander MOVISTAR s.t. 13 GESINK Robert LOTTO NL-JUMBO s.t. 16 BARGUIL WARREN GIANT-ALPECIN s.t. 19 ROLLAND Pierre EUROPCAR s.t. 22 FONSECA Armindo BRETAGNE-SECHE ENVIRONNEMENT s.t. 23 HERRADA José MOVISTAR s.t. 24 PAUWELS Serge MTN-QHUBEKA s.t. 25 BARDET Romain AG2R-LA MONDIALE s.t. 26 CHEREL Mikael AG2R-LA MONDIALE s.t. 27 SANCHEZ Samuel BMC s.t. 29 DE GENDT Thomas LOTTO-SOUDAL s.t. 30 BOASSON HAGEN Edvald MTN-QHUBEKA s.t. 32 PINOT Thibaut FDJ s.t. 34 KRISTOFF Alexander TEAM KATUSHA s.t. 38 POZZATO Filippo LAMPRE - MERIDA s.t. 41 MATE Luis Angel COFIDIS s.t. 42 BAK Lars LOTTO-SOUDAL s.t. 45 ROCHE Nicolas SKY s.t. 51 ROY Jérémy FDJ s.t. 54 CHAVANEL Sylvain IAM CYCLING s.t. 55 BARTA Jan BORA-ARGON 18 s.t. 56 VUILLERMOZ Alexis AG2R-LA MONDIALE s.t. 57 MACHADO Tiago TEAM KATUSHA s.t. 58 SCHÄR Michael BMC s.t. 59 ZUBELDIA Haimar TREK s.t. 60 MORABITO Steve FDJ s.t. 61 HOLLENSTEIN Reto IAM CYCLING s.t. 62 PLAZA Ruben LAMPRE - MERIDA s.t. 63 JUNGELS Bob TREK s.t. 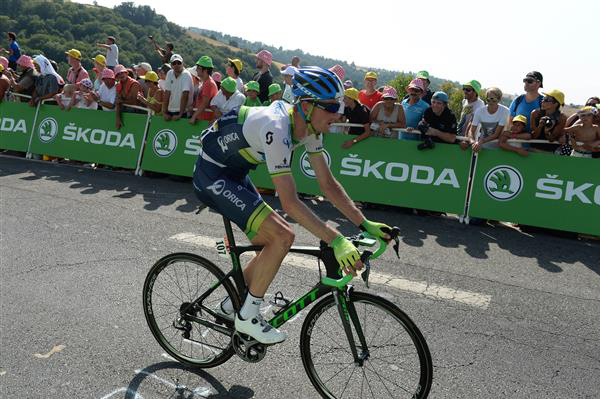 64 YATES Adam ORICA-GREENEDGE s.t. 67 KREUZIGER Roman TINKOFF-SAXO s.t. 68 CUMMINGS Stephen MTN-QHUBEKA s.t. 69 TANKINK Bram LOTTO NL-JUMBO s.t. 72 ANACONA Winner Andrew MOVISTAR s.t. 73 HALLER Marco TEAM KATUSHA s.t. 75 COPPEL Jérôme IAM CYCLING s.t. 76 URAN URAN Rigoberto ETIXX-QUICK STEP s.t. 78 CASTROVIEJO Jonathan MOVISTAR s.t. 91 VALLS FERRI Rafael LAMPRE - MERIDA s.t. 97 HAAS Nathan CANNONDALE-GARMIN s.t. 99 FEILLU Brice BRETAGNE-SECHE ENVIRONNEMENT s.t. 100 ELMIGER Martin IAM CYCLING s.t. 108 SERPA José LAMPRE - MERIDA s.t. 109 CARUSO Damiano BMC s.t. 110 WYSS Danilo BMC s.t. 111 DELAPLACE Anthony BRETAGNE-SECHE ENVIRONNEMENT s.t. 112 VACHON Florian BRETAGNE-SECHE ENVIRONNEMENT s.t. 113 EDET Nicolas COFIDIS s.t. 114 GENE Yohann EUROPCAR s.t. 117 ROWE Luke SKY s.t. 118 CARUSO Gianpaolo TEAM KATUSHA s.t. 119 PORTE Richie SKY s.t. 120 NAVARRO Daniel COFIDIS s.t. 121 HESJEDAL Ryder CANNONDALE-GARMIN s.t. 122 RODRIGUEZ Joachim TEAM KATUSHA s.t. 123 GHEBREMEDHIN Merhawi MTN-QHUBEKA s.t. 124 SENECHAL Florian COFIDIS s.t. 125 MEINTJES Louis MTN-QHUBEKA s.t. 126 ROGERS Michael TINKOFF-SAXO s.t. 128 OSS Daniel BMC s.t. 129 GRUZDEV Dmitriy ASTANA s.t. 131 GERARD Arnaud BRETAGNE-SECHE ENVIRONNEMENT s.t. 134 RAST Gregory TREK s.t. 135 DURBRIDGE Luke ORICA-GREENEDGE s.t. 136 TUFT Svein ORICA-GREENEDGE s.t. 138 MAJKA Rafal TINKOFF-SAXO s.t. 139 KWIATKOWSKI Michal ETIXX-QUICK STEP s.t. 140 HUZARSKI Bartosz BORA-ARGON 18 s.t. 141 GAUDIN Damien AG2R-LA MONDIALE s.t. 145 HANSEN Adam LOTTO-SOUDAL s.t. 146 CIMOLAI Davide LAMPRE - MERIDA s.t. 147 GRIVKO Andriy ASTANA s.t. 148 CURVERS Roy GIANT-ALPECIN s.t. 149 BRUN Fréderic BRETAGNE-SECHE ENVIRONNEMENT s.t. 150 DEVOLDER Stijn TREK s.t. 151 DEBUSSCHERE Jens LOTTO-SOUDAL s.t. 152 BRÄNDLE Matthias IAM CYCLING s.t. 153 RENSHAW Mark ETIXX-QUICK STEP s.t. 154 CHAVANEL Sébastien FDJ s.t. 155 FARRAR Tyler MTN-QHUBEKA s.t. 156 ANDERSEN Michael Valgren TINKOFF-SAXO s.t. 157 DIDIER Laurent TREK s.t. 158 ARREDONDO Julian TREK s.t. 159 VANMARCKE Sep LOTTO NL-JUMBO s.t. 160 FUGLSANG Jakob ASTANA s.t. 161 GREIPEL André LOTTO-SOUDAL s.t. 162 SIEBERG Marcel LOTTO-SOUDAL s.t. 163 LEEZER Thomas LOTTO NL-JUMBO s.t. 164 RIBLON Christophe AG2R-LA MONDIALE s.t. 169 PREIDLER Georg GIANT-ALPECIN s.t. 170 ERVITI OLLO Imanol MOVISTAR s.t. 171 VANBILSEN KENNETH COFIDIS s.t. 172 LANGEVELD Sebastian CANNONDALE-GARMIN s.t. 175 BENNETT Sam BORA-ARGON 18 s.t. Jean-Christophe Peraud finished the stage bandaged up after his crash. 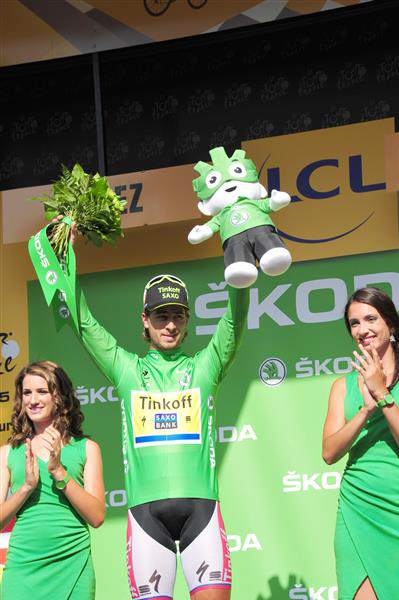 Peter Sagan increased his lead in the points classification today. 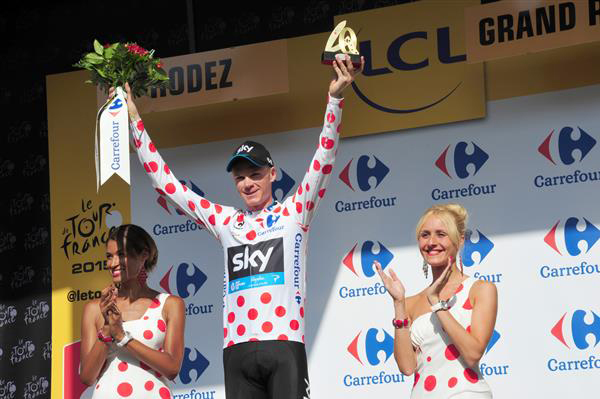 Chris Froome also leads in the mountains classification.